I found this paper, Hamstring Myoelectrical Activity During Three Different Kettlebell Swing Exercises. The paper compared how 3 different swings, the hinge swing, the squat swing, and the double knee extension swing (used in those who train for kettlebell sport) affected the hamstring muscles. The 3 hamstring muscles were divided into 2 parts a medial part (semitendinosus and semimembranosus) and the lateral part (biceps femoris). What they found was that for all three swings the medial hamstring worked more than the lateral hamstring. They also found that the hinge swing produced the most hamstring muscle activity throughout the entire movement compared to the other swings. What this means is that when a person is rehabilitating a hamstring strain we may want to progress from a swing that produces less strain to one that produces more. This is how Chiropractic care an help with the medical system. We can help take the stress off of the medical system in Canada for those with headaches, back and neck pain. In the USA, we can find Chiropractors in the hospitals, working along side medical doctors. I would love to see the day that we could work along side each other to help our mutual patients. 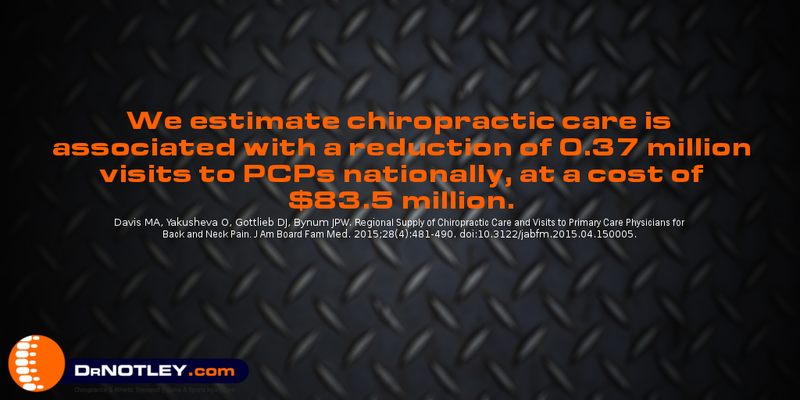 This study was performed in the United States so the numbers would not be the same but the evidence shows how Chiropractic care can help reduce the stress and burden on the medical system. Collectively, these studies suggest that coverage of chiropractic care among adults is associated with reduced spending on medicine and use of diagnostic tests in the population with private insurance. rests on a few trials of adequate methodological quality. Before any firm conclusions can be drawn, further testing should be done in rigorously designed, executed, and analyzed trials with followup periods of sufficient length.